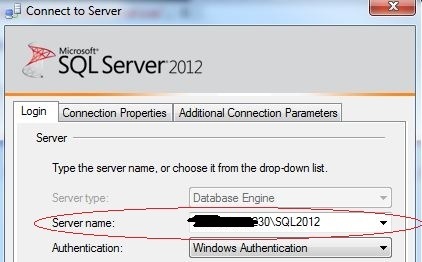 James' SQL Footprint: Why I can not connect sql server ??? Recently, I installed sql server 2012 on windows 7 laptop, today when I wanted to login sql server with TCP/IP, I got error. I tried to login sql server by SSMS with Server Name "MachineName\InstanceName", and select the Network protocol "TCP/IP"
My first thought was "TCP/IP" protocol had not been enabled. I opened SSCM, yes, it is not enabled. I tried to connect sql server again, but got the same error. Oh, you know what, I was connecting to the named instance, I need to checked if SQL Server Browser service is enabled, all named instance will register its port in SQL Server Browser service when it startup. when client use MachineName\InstanceName to connect sql server, if there is no port specified, client will talk with SQL Server Browser first to get the named instance port, then connect to that named instance by this port. if SQL Server Browser is disabled, you need to specify the port in connection string, so that client know how to talk with the named instance. for default instance, you don't need to spedify port if 1433 is default port. before I connected the server again, I try to verify the network setting was correct. 2012-04-09 22:24:16.59 spid13s Server is listening on [ 'any' <ipv4> 50909]. looks like very thing was good! I connected to sql server again with Server Name "MachineName\InstanceName, Port"
Done! I connected to the sql server with TCP successfully! Unable to complete login process due to delay in opening server connection". -l : Specifies the number of seconds before a sqlcmd login to the OLE DB provider times out when you try to connect to a server.The default time-out for login to sqlcmd is eight seconds. ok, after a long waiting, I logined the sql server with sqlcmd. for some special cases, you need narrow down the problem with the ways I mentioned upper, then work with windows or network engineer to troubleshooting it. normally, it is not difficult to solve connection issue , but if it can not be solved within a short time, it will be very tough issue! In some of the cases the MS SQL Server hostname connectivity issue occurs due to if string too long or string malformed. To tackle this problem chooses Cognegic’s Remote Infrastructure Management Support for Microsoft SQL Server or Online MS SQL Server Support. We are able to diagnose existing performance problem and also improved database performance and resource management. Our all technical experts are capable to configure, optimize and analyze storage engines.